NASA yesterday announced the first image ever taken of an exoplanet in visible light. Photographed using the Hubble Space Telescope (HST), the newly-discovered world orbits the star Formalhaut, a young hot star about 25 light years away. The star and planet are only about 250 million years old. Named Formalhaut-b (by astronomical convention the star itself is referred to as Formalhaut-a), the new planet orbits its primary once every 877 Earth years, putting it much farther from its star than Pluto is from our Sun. In the NASA HST image below, Formalhaut-b is visible as a bright speck of light, magnified further in the inset image. The distance of this planet from Formalhaut made its discovery possible. At that distance the light of its primary can be blocked mechanically by the HST, allowing astronomers to view the vast cloud of orbiting ice and dust that surrounds and orbits the star. 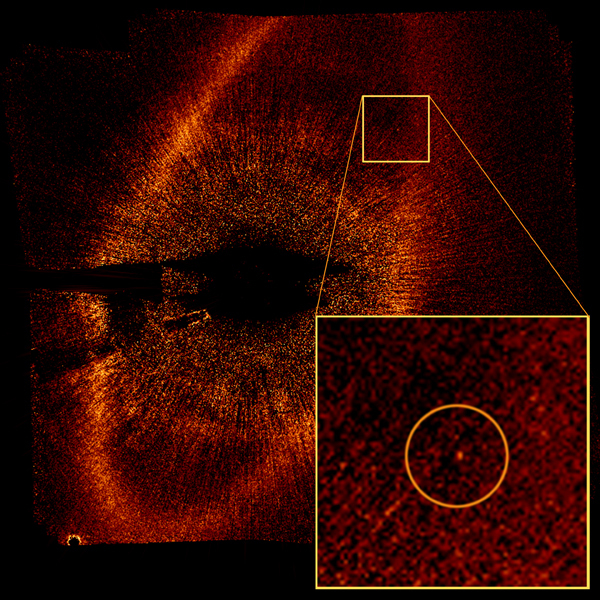 Formalhaut has a giant dispersed ring of debris (visible in the image above) similar to our own system’s Kuiper Belt. Our own Kuiper Belt is made of scattered bits and particles of ice and mineral dust left over from when our system formed, and includes probably hundreds of objects that approach the size of Pluto/Charon. Formalhaut’s Kuiper Belt was discovered in the 1980s using NASA’s Infrared Astronomy Satellite (IRAS), and in 2004 the belt was photographed in visible light using the HST. Further investigation led to the new pictures, which clearly show a large, bright object orbiting Formalhaut near the inner edge of its Kuiper zone. This supports earlier conjectures that a planet should be found, based on how clean the inner edge of the zone is there. A large planet at that location would act like a shepherd moon does around Saturn, keeping the ring edge clear of debris and gravitationally nudging objects beyond it back into stable positions if they stray to close to the shepherd. Formalhaut-b is a big world, and very bright. At about 20 billion km from its star it is about five times more distant than Neptune is from the Sun, which would make it a very cold world. However, its brightness and gravitational effects argue for size – anywhere from one to three times as massive as Jupiter – which would probably give the world a massive source of interior heat. Also Formalhaut-b is young, only about 200 million years or so, which would mean it still retains a lot of its accretionary heat, and would probably be swirling with planet-sized storms, bands and eyes. The planet may have a ring system, too, which would also help to explain its anomalous brightness. Beyond those details, it becomes hard to speculate. If it formed in place it would be mostly hydrogen and helium, like Jupiter, but would also probably contain a high fraction of light-element compounds such as ammonia, methane, and water vapor. Rocky material would be rare at that distance from its primary. Any moons orbiting the giant planet would be composed of ice… or perhaps liquid water or water/ammonia if the moons orbit it just the right way to induce tidal heating within them. Or… if August Derleth was right, Formalhaut-b is the home of the horrid Lovecraftian fire god Cthuga, a monstrous orb of living plasma shackled within the frozen planet eons ago by the Elder Gods. NASA had no comment on this last point. But Cthuga would make a pretty cool planet name. I’m just saying. ~ by Planetologist on November 14, 2008.